Nice touch, reminded me of one of the Hell Boy movies. Naturally that's a bat hanging from the light above the doorway. I'd love to go all-out like the people in your pictures did. They did such a great job! But my only decoration is a human-sized ghostly spectre in a gossamer shroud that was purchased for super cheap after a past Halloween. 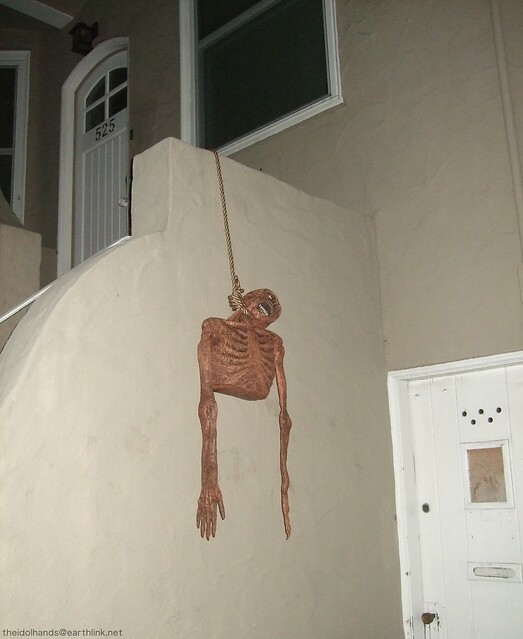 I hang it so it looks like someone standing at the rail of my front porch. My neighbor downstairs has commented that it startled her every time she came home. X-D I'll settle for that! I feel you. I think one needs to go out of their way to volunteer now, because it's become more popular to organize kids instead of letting them go to individual houses. I grew up in an apartment complex and then in a suburban neighborhood -- I'm so, so glad I got to experience the utter excitement of that before it changed. I'm sure some people still do it the old-fashioned way, and there are valid safety arguments for organizing stuff, but...it's not the same. I like the black and white version. It makes all that kitschy stuff look spooky. We actually had snow on Halloween, even though winter has been mild so far. I missed out on taking the kids around, but still visited places, like a church and assisted living home that had indoor stuff going on. Now I have kids, I might decorate more. Please share photos if you do! cute. don't really have the money to decorate or hand out candy, but i still like halloween. The amount of kids we get vary all the time, along with the costumes. 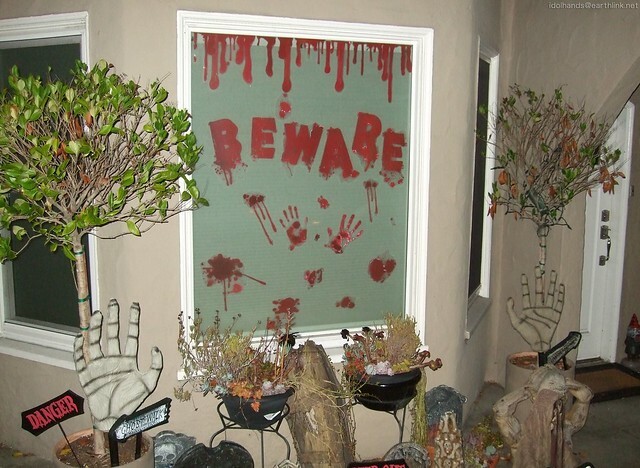 I am not very good at decorating for Halloween, alas. I can imagine, you're much better at horse-themed happiness! Thank you! I find them very inspirational too! This is really neat! 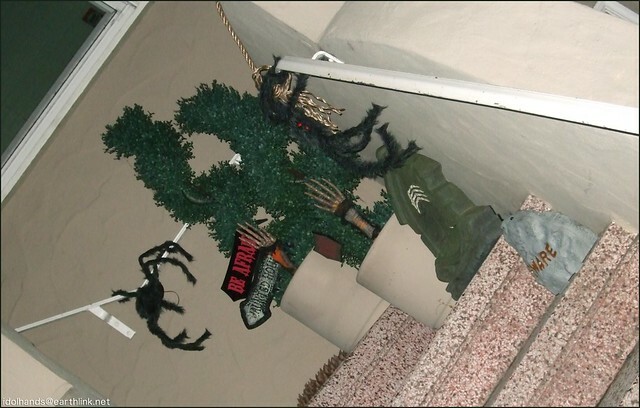 we decorated for Halloween but not outside. nice! 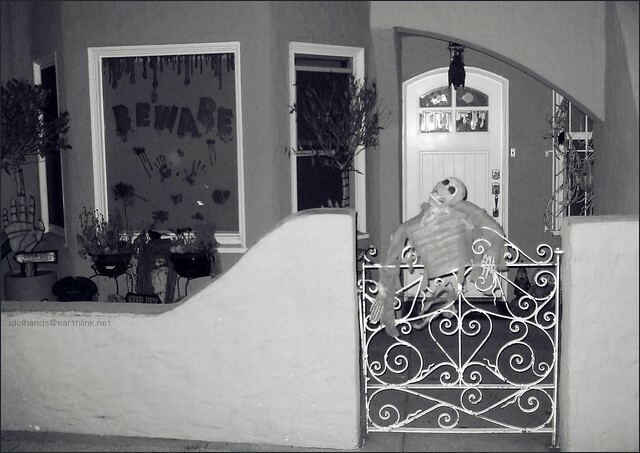 I decorated for Halloween, but sadly we only got 3 trick or treaters. :/ I think it's because most people around here seem to go to the "safe" Halloween things like the various church's trunk-or-treat things. Which I guess is understandable, but still kinda disappointing. Yeah. And I think of your neighborhood as being a safe one too. Hmph. I guess it's true what they are saying about this helicopter parenting stuff. I mean...in a city like mine, it can make more sense, but in rural areas like yours...unless there is more going on than I know...I'd have to cough some of it up to laziness too. It's just easier to go to an event then hike around a neighborhood. My family used to do both though.